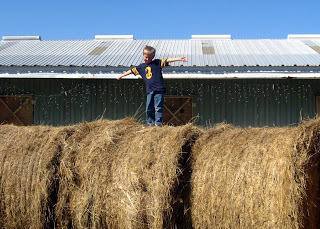 We’ll take about 150 rolls and make a hay maze for the kids to play in. We’ve done this several times and the kids really love it and it’s a big hit at the Halloween party. 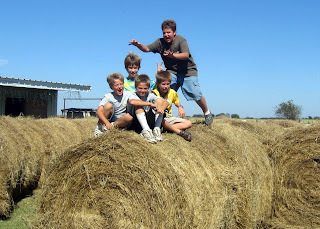 I came up with some names for the hay maze — how about “hayze”? Ok, what about “haytrix”? That’s all I could come up for names. A Hayze or Haytrix is time consuming to design and put together, but it’s worth it. Even in the early stages it’s fun. Here’s Noah hamming it up. Benjamin and Zachary are over for a visit. Looks like Russell is about to pounce. Red even jumped up on top of the bales. He didn’t stay up there for long. The bales are about 5ft tall by 5ft wide. USDA Issues a "Grassfed" Standard — Is it Weak? The problem with the certified organic label is it allows for lots of loopholes. Consumers can’t be sure they’re getting what they imagine. It’s best to know exactly where your food comes from. Now the USDA has issued some new guidelines on what can be called “grassfed”. The American Grassfed Association is against the new grassfed standards. I’m a member of the American Grassfed Association and I’m sure I support them in this. We raise our animals to the highest possible standard, so we’re in favor of enforcing only the highest standards. I don’t want there to be any loopholes in this. When consumers buy something called “grassfed” they should get exactly what they expect. Here’s a link to the press release. The American Grassfed Association is against the new grassfed standards. I’m a member of the American Grassfed Association and I’m sure I support them in this. We raise our animals to the highest possible standard, so we’re in favor of enforcing only the highest standards. I don’t want there to be any loopholes in this. When consumers buy something called “grassfed” they should get exactly what they expect. Here’s a link to the press release. 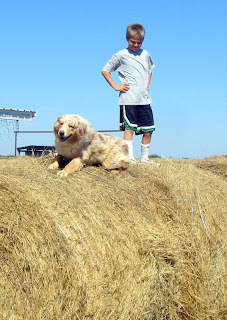 Here’s a great blog entry from “Sooz” in Texas spelling out the reasons why we should buy food from sustainable sources. I couldn’t agree more. I especially agree that the meat just tastes better. Wish You had a Star Wars Food Replicator? Yeah that’s kind of a cool concept. A microwave looking thing that just creates whatever food you want. But according to this article, we’ve become addicted to corn. “Cheap corn gave us the cheap hamburger, as well. Corn, a high-starch feed, fast-fattens cattle; it’s now the main ingredient in the bovine feedlot diet. Americans have a weak-spot for corn-fed beef, which has as much as five times saturated fat as grass-fed beef. In fact, if you were born in the last thirty years in America, chances are you’ve only ever eaten corn-fed beef. So it goes: the seemingly diverse foods in the supermarket — can of soda, disc of beef — have common ancestors in the Corn Belt. This is what they say at the Indianapolis Star. Check it out here. By the way I agree, go with the free-range, grassfed beef that was raised on grass free from chemicals and pesticides and raised with no hormones. The USDA Finally Issues a Definition of "Grassfed"
Good blog entry here about the health benefits of grass fed beef. This article is an eye-opening look at how some of the major conglomerates move behind the scenes to lobby for changes in the legal definitions of “organic products” and “pasteurization”. I know why they do these things and I’m not suggesting a sinister motive. I just know that raising chickens and cattle that are really “free-range” and really “grass-fed” like any regular person understands that terminology is prohibitively expensive. You can’t make a large profit doing it. Until a larger percentage of people demand it, it won’t happen. I think the movement is happening.